A few weeks ago, we didn’t know the answers to these questions. However, because we think it’s important to know what you are eating and how your food is produced, to ensure both good human and environmental health, we set out to find those answers. 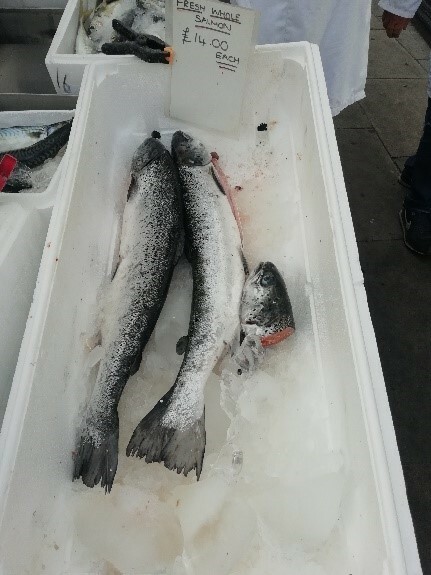 Whilst seeking data to present in a sample UK Sustainability Dashboard (see our previous blog), similar to those supported by Huon Aquaculture  and Tassal , we were surprised by how much information we were able to find about the farms that Sainsbury’s source their salmon from. We used Sainsbury’s as a case study because they are the only retailer in the UK, that we are aware of, that names the specific farm on their packaging. From the retailer merely displaying the name of a farm in Scotland on their packaging, we were able to use a number of different resources, such as Scottish Government’s Scotland’s Environment , Scotland’s Aquaculture  and Marine Scotland’s Seal Licensing Team , as well as the Aquaculture Stewardship Council  (ASC), to observe data on the types and quantities of chemicals used, the amounts of fish produced, fish and seal mortality rates, amongst other such information. Whilst it is true that we were able to access this information publicly, it is also fair to say that much of the data is disparate and at times contradictory, despite the fact that three of the above referenced sites are regulated by Scottish Government. Best Fishes strives to encourage the development of a single Sustainability Dashboard where information can be added by suppliers and farms, and be accessed by retailers and consumers. We feel that this will increase the transparency of the industry, whilst creating positive competition between brands as they strive for increased customer satisfaction. Whilst compiling our research, we found that it was not possible to get information regarding the consequences that farms might face if they were to exceed maximum limits of capacity or chemical use, or if they were deemed ‘unsatisfactory’ by a regulator, such as Scotland’s Environment Protection Agency (SEPA), or by a certification body such as the RSPCA Assured. Of the wide range of certification bodies used in the Scottish salmon farming industry, only the ASC publishes audit reports for individual farms online, and unfortunately few Scottish farms have achieved ASC certification. Best Fishes wants this information to be clear and readily available to allow retailers and consumers to make a fully informed choices about the practises they are supporting when they spend their money on Scottish farmed salmon.